There are many ways to create the perfect vanilla bean cheesecake recipe. Give this one a try: it is layered with vanilla and white chocolate and sure to please vanilla and chocolate lovers alike. 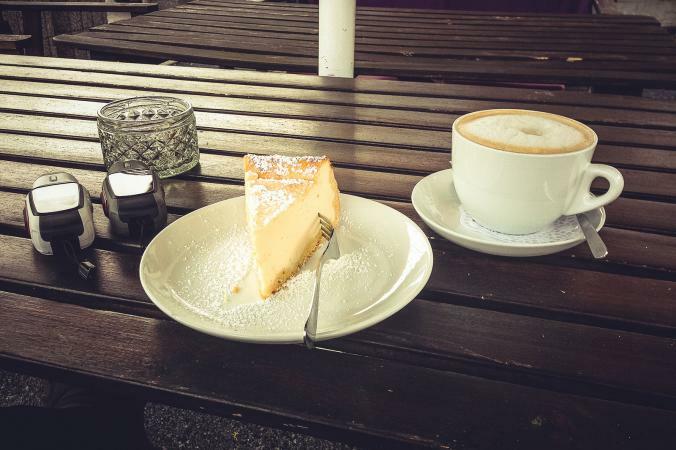 What is considered the perfect vanilla bean cheesecake is partially a matter of taste, but a few determinants of a well-made cheesecake are in its final consistency and overall appearance. If you are looking for a vanilla bean cheesecake recipe that yields a firm, yet not too dry texture give this gourmet recipe a try. It is made with Mexican vanilla beans, white chocolate mousse and cream cheese chocolate ganache filling. It's laced with layers of decadent white and dark chocolate and is finally topped with fresh raspberries and more tempting dark chocolate. It will take a few hours to whip this up, but is well worth the wait. Use simple yet delicious ingredients from the pantry to make this cookie crust recipe; another quick and tasty alternative is to mix butter with your favorite cookies on hand. Chocolate chip cookies or shortbread cookies are always a pleaser with a vanilla bean cheesecake recipe. Cream the butter and sugar, adding the egg yolks one at a time. Stir in flour, salt and vanilla and mix well. Press the cookie crust dough into a greased baking pan and bake for 10 minutes. This cheesecake filling is a deliciously rich concoction speckled with Mexican vanilla beans and vanilla's complementary opposite - chocolate - whipped up from a white chocolate ganache recipe. Put vanilla beans along with the sugar in a bowl and cover completely with clear wrap. Allow the vanilla beans to infuse with the sugar overnight. Heat the cream in a small saucepan until hot, but not boiling. Add the white chocolate shavings to the hot cream and set aside. Stir mixture until chocolate is completely melted and forms into a creamy chocolate ganache. Beat one package of softened cream cheese in a bowl, slowly adding one-half of the vanilla-flavored sugar until mixture is creamy. Add the remaining packages of cream cheese and vanilla-flavored sugar and beat until smooth and creamy. Fold in the chocolate ganache and continue to beat with a mixer or by hand. Add eggs one at a time, and mix until fully blended. Add salt and vanilla extract, and pour filling into the precooked cookie crust pan. Bake at 325 degrees for one hour. Remove and cool for one hour or until completely set. Try decorating your vanilla bean cheesecake with this creamy, smooth chocolate mousse recipe. For a twist, substitute white chocolate chunks with dark chocolate squares. In a double boiler, slowly melt chocolate baking squares over low heat. Allow melted chocolate to cool completely. In a chilled bowl, add heavy whipping cream and sugar. Gradually add sugar to the heavy cream and whip until stiff peaks begin to form. Chill the whipped cream in the refrigerator for at least one hour. In a second bowl, add the cream cheese, vanilla extract and chocolate and beat until light and airy. Gently fold whipped cream into the chocolate cream cheese mixture and return to the refrigerator to chill. Pipe or use a spatula to spread the white chocolate mousse over the cheesecake once the cheesecake has baked and set. 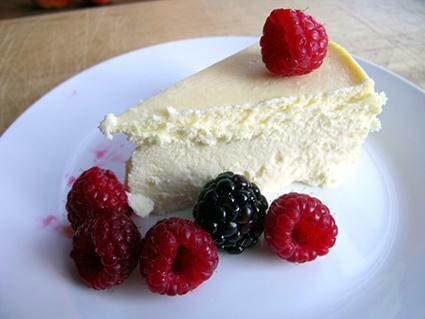 Cheesecake is best served chilled to help preserve the texture and firmness of the dessert. For best results, refrigerate the cheesecake after each step; when finished cover it tightly and refrigerate until just before serving. While garnish, such as berries, can be added at any time, present each slice of cheesecake on a plate with a cluster of berries, an extra drizzle of chocolate and some whipped cream. Garnish the plated cheesecake with bittersweet dark chocolate and fresh berries such as raspberries for a touch of elegance and a medley of subtle flavors. In a double boiler, melt the dark chocolate over low heat. Slowly drizzle melted chocolate in a decorative pattern over the plated cheesecake. For best results, chill the plates first and drizzle the chocolate across them as well. Place a small dollop of whipped cream in the corner of the plate and garnish with fresh raspberries. Give this vanilla bean flavored cheesecake recipe a try. The medley of flavors, combined with the beautiful presentation is sure to be a hit with all who try it.